holds displays up to 22 lbs and 24”, VESA compatible, supports portrait or landscape, one-hand adjustment, adjustable keyboard arm, retractable mouse tray, swivel, pan and tilt adjustment. 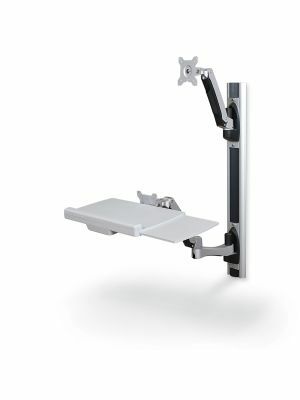 The 66644 HG wall mount workstation offers the best yet flexible mounting solution to the users. 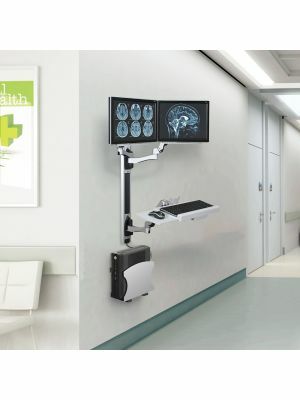 The heavy-duty HG wall mount comes with exceptional features that are customizable according to users’ accessibility. The 66644 HG wall mount has eliminated the need of buttons, levers, switches and knobs, thanks to its innovative one-touch adjustment technology. Users can easily perform number of tasks by just using only one hand such as tilt adjustment, pan adjustment or rotate. With the spring-loaded joints, the arms stay firm and can be repositioned easily. The 66644 HG wall mount comprises a single keyboard arm and a monitor mount. The keyboard arm offers height, lateral and tilt adjustment according to the need of users. There is a retractable mouse tray that can be used on the right or left side of the keyboard. The monitor arm is capable of holding displays up to 24” with maximum weight of 22 lbs. The optional additional monitor mount and CPU holder is available to be used with the 66644 HG wall mount. 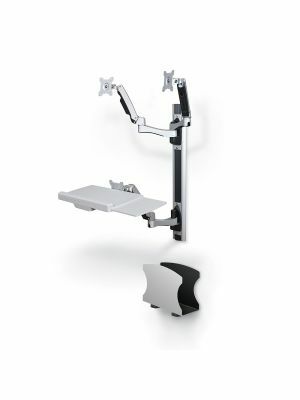 The Balt 66646 additional monitor arm is used with HG wall mount workstation that feature easy adjustment according to the users’ need. It smoothly slides over the base and can be locked at any position. The 66646 monitor arm doubles the efficiency by providing customizable functions and saving a lot of floor space. It comes with height, pan, tilt and swivel adjustment with only one hand. Users can adjust the displays in portrait or landscape alignment. It accommodates displays with size up to 24” and weight up to 22 lbs. The 66644 additional monitor arm is recommended for the environment where multiple users work on a single workstation. Q. Does Balt HG wall mount come with warranty? Q. Does the Balt HG wall mount hold displays more than its weighing capacity? A. Yes, the Balt HG wall mount can hold displays more than its capacity, however it is always recommended to use the carts of required capacity. Our store offers carts that accommodate all kinds of displays. Q. Where can I use the Balt HG wall mount? A. The Balt HG wall mount is ideal for every kind of industry such as business environments for presentations and seminars and class room environments for lectures and collaborative discussions. Q. How can I clean the Balt HG wall mount? A. In order to clean the Balt HG wall mount, use the wet and soft sponge and lightly rub over loose dirt.